The Shakti Peethas (holy places of cosmic power) are places of worship consecrated to the goddess 'Shakti', the female principal of Hinduism and the main deity of the Shakti sect.Shakti Peeths are very important and ancient Hindu religious pilgrims. Goddess Sati is the incarnation of Maa Parvati, the kindly goddess of harmony, marital felicity and longevity, with Durga, goddess of strength and valour, and with Mahakali, goddess of destruction of the evil. According to legend, at some time in Satya Yuga, Daksha (who was the son of Lord Brahma) performed a yagna in a place called Kankan (near Haridwar) This Yagya was named Vrihaspati Yagna. He performed this Yagna with a desire of taking revenge on Lord Shiva. Daksha was angry because his daughter Sati (one of his 27 daughters) had married the 'yogi' God Shiva against his wishes. Daksha invited all the deities to the yagna except for Shiva and Sati. The fact that she was not invited did not deter Sati from attending the yagna. She had expressed her desire to attend to Shiva, who had tried his best to dissuade her from going. 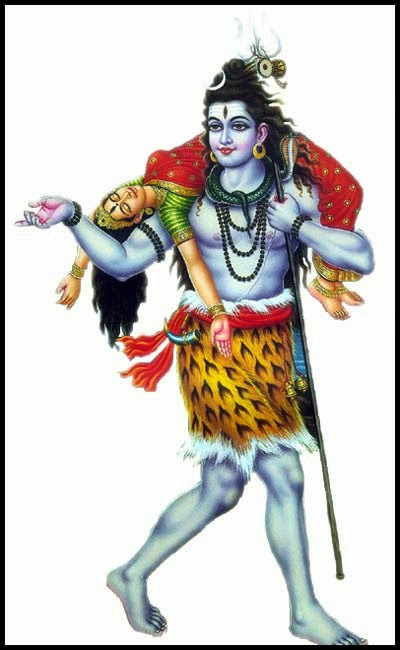 Shiva eventually allowed her to go escorted by his ganas. But Sati, being an uninvited guest, was not given any respect by his father. Further more, Daksha insulted Shiva. Sati was unable to bear her father's insults toward her husband, so she committed suicide by jumping into the yagna fire (sacrificial fire). When Lord Shiva heard about her death he became furious. He along with his ganas (followers) went to the place where Daksha was performing his oblation. The oblation site was completely destroyed by Shiva and his ganas (mainly by the great Veerbhadra) and killed Daksha. Lord Shiva then carried the corpse of Sati and started dancing furiously all over the place like a lunatic. The other gods intervened to stop this dance. To bring down his anger, Lord Vishnu severed the dead body with his Sudarshan chakra. Various parts of the body fell at several spots all through the Indian subcontinent and formed the sites of which are known as Shaktipeeth. In order to view the index, which is based on Tantra-Chudamani , reveals as to which organ fell at which place and which Bhairav and which Shakti have their dwellings at which place.. Here is 51 Shaktipith List with Location with state,Part of the body, Bhirava,and Shakti name, so you can Click its name and get All information Shaktipith temple like Temple Location,Temple significance,Temple History,Temple timing,Entry,Temple Pictures,How to Reach there,and Location Map and many more.